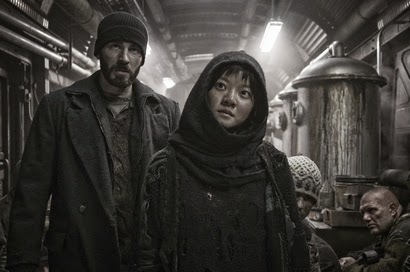 About a month ago I was invited to see SNOWPIERCER on the big screen. As many of you know I saw the film back a few months ago on a French import DVD (My original piece can be found here) As much as I liked the film I wanted to see it not only big, but subtitled in English since part of the film in in Korean and what is said, especially toward the end of the film is vital to understanding the movie. I’ve now seen it big and subtitled in English and I think the film is even more impressive then I first thought. For those who don’t know the film is the story takes place on a world that has been frozen. A plan to stop global warming has frozen the world. The only ones alive are those on a miles long train that circles the globe once a year. A group of people in the tail section of the train are tired of feeling like cattle and they stage a revolt and begin to make their way to the front of the train. The film kind of a two part film. 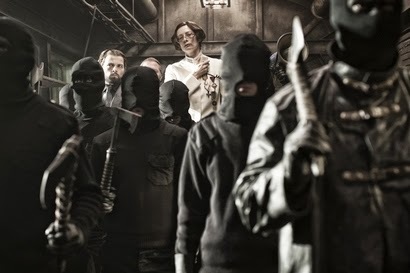 The first half of the film is a kind of straight forward action film with the tailenders fighting their way forward and the second half is what happens once they get toward the fancier front of the train. While the film maintains a certain level of action, it also becomes more thoughtful. Actually the point that the tailenders cross into the garden section the film kind of goes into a Wizard of Oz mode with the film making a switch much like the 1939 film when Dorothy wakes up in Oz. Seeing the film again I’m less split on the film, it is a masterpiece of science fiction despite its flaws. Before I wax poetic I should probably answer the question What are the flaws? The other problem with the film is the shoot-out between cars. One of train owner Wilfred’s men has gone round the bend and he begins to have a shoot-out with Chris Evan when the train is going around a bend. He shoots across out a window and across an open space to another train car. It looks cool, but it makes no sense-even with the bad guy as completely nuts as he is. To be honest this is a film that needs to be seen more than once. To really appreciate what it’s aiming at you need to know who everyone is and know what some people are doing (say looking out a window at something in the snow-why is that key? You don’t know until you get to the end). While the questions you have early on are answered at the end, knowing the answers when you see the film again changes your perception of things. It adds a resonance that is missing the first time through. More importantly what you think may be random or off handed actions or a flub, turns out not to be. The bumps smooth out. When I went into the screening room to see the film this last time I took a seat literally next to the door out. My feeling was that I had seen the film and that once I got a taste of it on the big screen I could bolt. What actually happened was sitting in the theater I fell into the film deeper than before. Any preconceived notions were gone (The story of the film’s road to release is legendary) and armed with knowledge of later developments of the plot I could see things as the really are. Being a second time passenger familiar with the workings of the train things made sense and the film suddenly felt deeper and more complete. I could feel the toll taken on the group of rebels and I could feel their pain more. I went from I’ll stay for a little bit, to hanging in to the bitter end. I went for thinking the film is a glorious mess to the film is a brilliant masterpiece. Its truly great film of great intelligence that takes a step or two away from the pack and becomes something that’s going to be debated and enjoyed for years to come. Go see the film ASAP- and then go see it again. The film screens tonight as the Centerpiece of the Brooklyn Academy of Music's BAMcinema Fest with the director in attendance. Tickets at the BAMcinema Fest website. 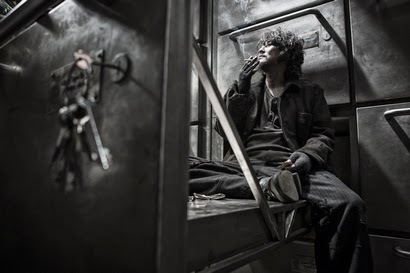 There is a special screening with director Bong Joon-ho tomorrow night at Lincoln Center. Tickets and information can be had by going here.